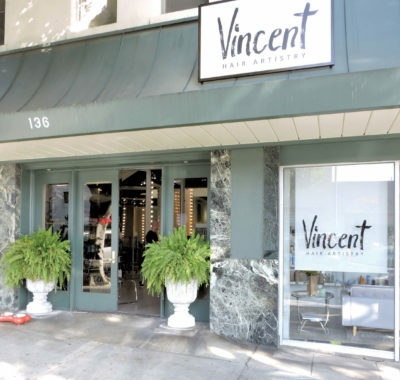 HAIR STYLES have changed at the Julius La Bonte building since 1921, now home to Vincent Hair Artistry. Romi Cortier mixes fine art with style at his salon Romi Cortier Design, 425 N. Larchmont Blvd., where his original paintings adorn the walls and clients are treated to private rooms and a top-notch team. “The most important thing to consider, regardless of trend, is does it look good on you, working with your skin tone?” says Cortier, who opened his local salon in 2001. Extensions, hairpieces and wigs are also bigger than ever. Hair products at the salon include Enjoy, HBL and Formula 18. “One of my ‘must-have’ products is the leave-in conditioner by Formula 18. One client who appreciates his skills is Windsor Square resident and actress Sharon Lawrence. “I’ve been doing Sharon’s hair since her days on ‘NYPD Blue,’” long before her four Emmy nominations. She’s also very active in The Ebell and Heal the Bay, and she is an advocate for women’s rights and women’s empowerment. “Dare I say she’s been one of my best clients over the last 20-plus years. Loyal. Supportive. Beautiful, both inside and out…. She’s part of my L.A. family,” said Cortier. Stylist Amy Robinson has seen many trends come and go in her 35-year career, which is why she pretty much ignores most of them. “Each person is an individual,” says the stylist at Jessica from Sunset, 124 N. Larchmont Blvd., where she has cut and styled hair for the past 13 years. “If spandex is in style and you’re 350 pounds, you should not wear it, whether it’s in style or not,” she smiles. After a bad cut on her curly locks in high school, Robinson vowed to make her clients look fabulous when they leave the salon and keep looking good long afterwards with manageable cuts. “If you have super straight hair, you can do almost anything.” Curly hair can be worn long and managed with a wand brush. Some styles are simply not for “wash-and-go” types. Highlights are her favorite and, with the different chemicals and colors involved, she draws on skills she learned in her higher math classes. The result is worth it. “There’s no one better at doing hair color than me,” she says proudly. Haircuts and styling have been taking place on Larchmont Blvd., since the dawn of time, or at least since 1921, when Julius La Bonte built most of the brick building on the east side of Larchmont Blvd., north of First St.
Legend has it that women (and men) have been visiting establishments at 136 N. Larchmont ever since 1921, as that address has been home to on (and men) have been visiting establishments at 136 N. Larchmont ever since 1921, as that address has been home to one salon after another, including Haas & Co., which closed last year after 30 years on the Boulevard. “When you walk out of our space, we are confident you’ll feel the best you have ever felt about your hair. I’ll stake my name on it,” said Vincent. “‘It’s all been done before’ is an old adage but still rings true, only this time there have been some fresh takes on seen-before styles,” he added. Blunt cuts resting on the shoulder or just below the collarbone with textured layers sparingly placed are popular, with one, maybe two, rotations around a closed curling iron or wand with the ends left out, explains Vincent. Vibrant colors inspired by Japanese animé are in vogue. “I really like the pastels like pale pink or dusty rose; lilac is also hot right now,” adds Vincent. Highlighting techniques at the salon include balayage and two-step, and products here are dedicated to preserving the integrity of the hair. “Olaplex is a game changer in that the technological breakthrough allows for zero breakage when applying bleach or hi–lift tint. Keratin treatment is for smoothing and reversing volume on overly thick hair,” notes Vincent. Unlike other parts of the city, “people here tend to have a clear picture of what they want,” says Omar Alarcon at Larchmont Barber Shop, 142 ½ N. Larchmont Blvd. Buzz cuts are popular, says Alcaron, who also trims beards and goatees along with standard cuts. Owner Jorge Hilario took over the reins from Jerry Cottone, who called it quits after 40 years. Jerry’s father, Vince, preceded him as a Larchmont barber. Hilario says he believes that his space, which also is in a La Bonte building, has — like the space of Vincent Hair Artistry — been providing hair care continuously since the building’s construction in the 1920s. Hot-towel shaves are still on the old-school menu. Larchmont Beauty Center, 208 N. Larchmont Blvd., has it all, and then some. Walk past counters of make up, rows of candles, moisturizers, soaps, shampoos and jewelry, and you will find the salon. Two stylists are available. Salon Provence, 417 N. Larchmont Blvd., opened in the Village in 1999 and has been serving customers for “close to” 20 years, says one happy patron.